Description: In this one day plein air gouache workshop, we will be focusing on capturing the landscapes around us in small 5”x7” studies. Students will practice using a 1 inch flat brush to focus on brush economy, shape language, and simplification before detail. We will practice doing small value studies first, and then dive into doing color studies. The goal of this workshop is to allow students to familiarize with the medium from the bottom up and solidify their skills in value and composition, so that they can create beautiful paintings with any color palette! 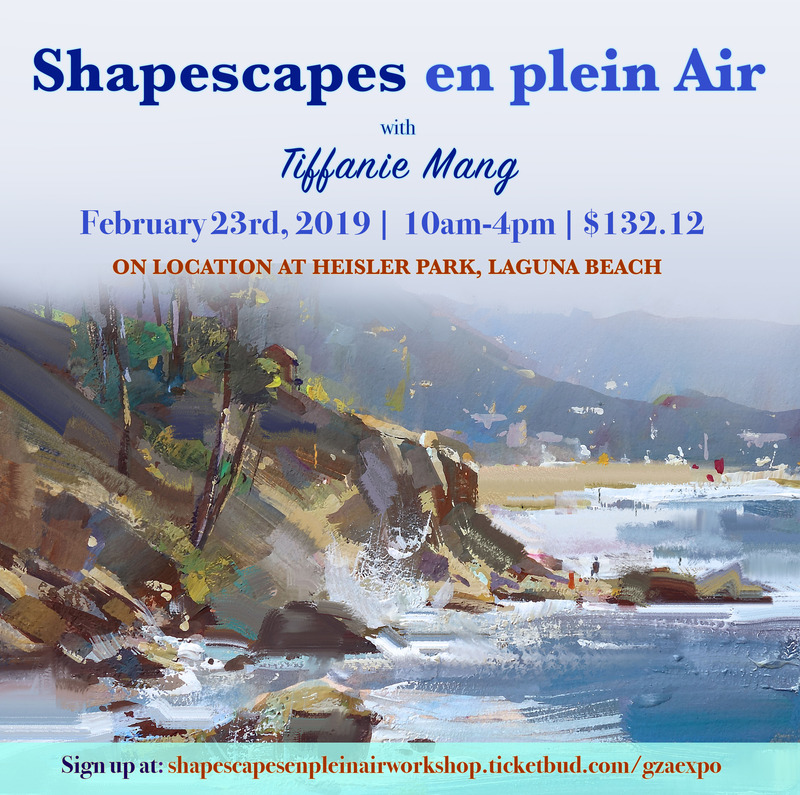 Tiffanie will be demoing how to do value and color studies en plein air and explain the fundamentals of how lighting and color relationships depend on composition and value to tie a piece together. Tiffanie is an illustrator, concept artist, and plein air artist from San Diego. She studied at the University of Southern California, graduating with a BA in Animation and Digital Arts. Aside from working in the animation industry, her biggest passion is plein air painting and painting landscapes traditionally in oils, where she loves to explore the possibilities of how she can use this skill as well in digital media, animation and film. In 2016, Tiffanie worked as a painter animator on Loving Vincent, the world’s first fully hand painted feature film in oils, which was also a 2018 Oscar nominee for Best Animated Feature. Flying over to Gdansk, Poland to take an animation test in May, she worked on the film for 6 months after passing testing and training. It was an absolutely incredible experience that changed the direction of her life. Being surrounded by so many talented international fine artists, Tiffanie knew that when she went back to the states, she had to somehow pursue her passion for fine art more and make it a reality. That is why now after living in LA for 7 years and working as a freelance concept artist for various companies, Tiffanie moved back to San Diego, where she has own studio at Art on 30th. In her free time, Tiffanie is always plein air painting in gouache, oils, or teaching classes and workshops. In this 2 hour lecture/workshop students will learn the ins and outs of how to put together a pitch packet. Learn what to include, what not to include, and how to lean on your strengths. We will cover small things that make a big difference like formatting fonts, as well as big things like how to write a proper longline and character description. Pitching a show can feel like a daunting task, but once you know the basics of how to put together a proper pitch packet, you’ll be able to pitch to any studio with confindence. Caroline is a 10+ year industry veteran with a background in both stop motion and 2-D animation. After graduation CalArts in 2007, Caroline went on to work on shows like Robot Chicket (art dept), Bojack Horseman (storyboards/animation), and Rick And Morty (animation/character design). Her love of creating original characters and concepts come together with Toasty Tales, an original pilot for Amazon that combines 2-D amimation with miniature sets as backgrounds. Today, Caroline is a freelance writer and continues to pitch shows and use her powers for good. Jenny Hogan will demo how to make a build-up stop motion puppet, which is a good, inexpensive way to make a puppet for your own animation. The same techniques are widely used, and are the basis for making the thousands of puppets each season on Robot Chicken. Basic armature making, including tie downs and how to rig the puppet for animation. Building up the puppet’s body. Sculpting a head, facial expressions including mouth and eye animation. Finishing and painting, including skin and hair. Jenny will talk briefly about the different types of puppets that can be made as well. She will have all stages of the process available to look at, and will demo how to use all of the materials (these will be the same used in the kit). Jenny will also talk about the other processes like molding and casting. Kits will be available for purchase for an additional cost (around $25 and are optional). This will be an information heavy class. Atendees do not need to bring anything, it will be more of a demo. Questions are always encouraged!